When you think of the name “Ronald McDonald”, what springs to mind? A clown who is just as creepy looking as he is infamous? The “Joe Camel” of fast food? I wouldn’t say that glorious imagery sprung to mind when I used to hear the name myself, but maybe after reading this post you will have a new-found respect for it. We’ve all been to a McDonald’s at some point in our lives, and I’m guessing that most of us would recognise this logo which is found on the charity boxes placed at every till point. This logo represents the Ronald McDonald House Charities (RHMC), which are based right here in Northern Ireland, the rest of the UK, Ireland, and all over the world. I tend to throw change into charity boxes on tills when I buy things, but as much as I do that I never really think about the charity I’ve just donated to after I walk out the door. I also always tend to think of big global and dominant brands as being somewhat selfish. For example, after finding out that Starbucks Ireland only payed 45 euros in tax last year, I tend to think twice before I invest in one of their seasonal lattes. I’ve recently learnt that not only do McDonald’s and their franchisees allow the placement of RHMC collection boxes at each till point, the company also donates money from its own sales. In 2016, they added an extra one million pounds donation from sales to the existing three million that had been collected in the UK that year. RHMC pride McDonald’s as an “essential, valuable and sustaining partner” and McDonald’s even provide office space to the charity in their Head Quarters around the world, along with general and administrative support, HR, payroll, organisation support and ICT and computer systems. RHMC globally has been McDonald’s charity of choice since its founding in 1989 and provides hope and respite to families during challenging times of life. The thing that inspired me to read more into McDonald’s corporate philanthropy and the RHMC, was a tweet by an individual who was personally affected by the works of the charity and was highly praising them. 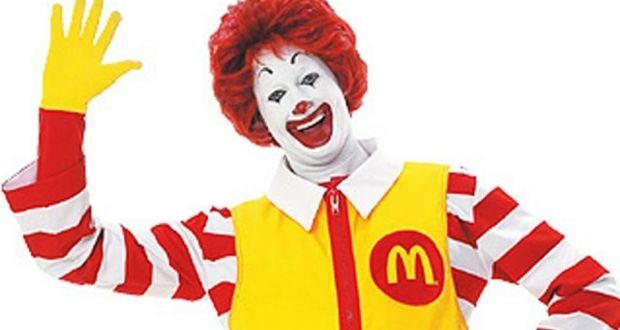 So, there you go, Ronald McDonald will continue to look creepy but hey! He’s a good guy. And McDonald’s may be swimming in profits and sitting comfortably on the Forbes’ list of “Most Valuable Global Brands”, but their philanthropic measures should not go un-noticed. Rachel Hello and welcome to the place where my inner-thoughts come to play. I am twenty years old and currently studying "Communication, Advertising & Marketing" at Ulster University.